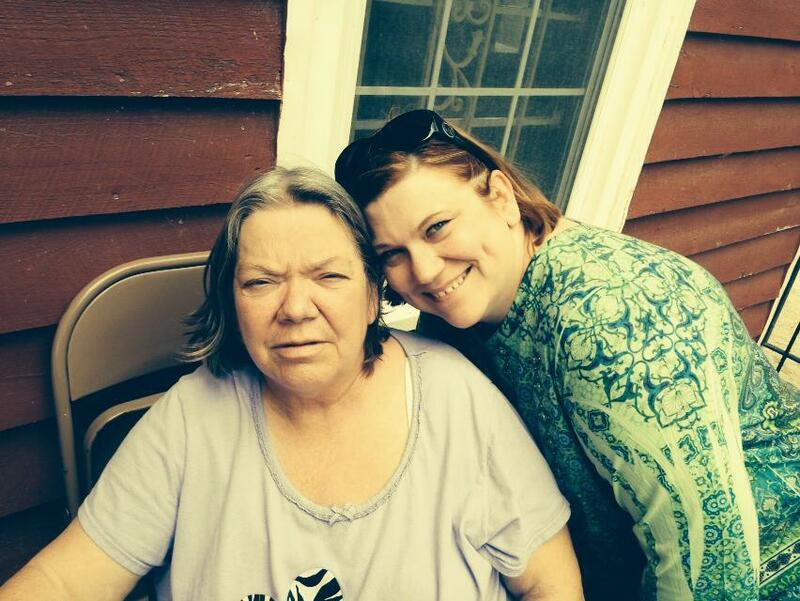 For those of you who know me, you also know this: my relationship with my mom has never been easy. Truthfully, is any mother/daughter relationship really easy? We’re so very different–in almost every way. There has never been a time we’ve understood one another, but I think we’ve both come to accept that.As a teen, I strove to be her polar opposite. I didn’t think I’d ever want to be a wife, and I sure as heck didn’t want to be a mother. She used to drive me utterly bonkers–she didn’t understand my need for college, to get out of Springdale. I guess she forgot that when she was 18 the very first thing she did was move to Tulsa, all by herself, just to see if she could. Nobody in our family had ever broken free that way before. In the end, she moved back to be near the family and because she loved Arkansas. I guess I understand that part of her. As I’ve gotten older, I’ve learned to be more accepting of my mom and who she is, and I think she’s found the same peace with her crazy, unpredictable firstborn. I’ve also learned that even though I may have resisted her advice and may have believed that she had nothing to teach me, she’s been teaching me all along. Maybe I’m the one who has changed and not she. Here are 5 things my mama taught me. 1. The value of hard work. My mother quit high school her freshman year to get a job. It wasn’t because she hated school or learning, she wanted to help her mother feed and clothe her nine siblings. . My mother worked various waitressing jobs and seasonal farm work–picking peaches, berries, etc.–to help my grandma feed those kids. Then, when my sisters and I were growing up, she worked at a chicken plant, standing for 12 hours a day in a freezer. I know she wasn’t thrilled to work there, but she did it. As a result, I, too am hard working. I don’t know how to be otherwise. Both my parents instilled a diligent work ethic in me that sometimes threatens to cross the line into workaholicism. You know what they say about anything in excess? 2. Unreasonable stubbornness/perserverance. This trait has both served me well and been my folly. Sometimes I take a bit of time making a decision, but once it’s made I stick to it, TO A FAULT. I will hold on with nothing but my fingernails until whatever I’ve decided has either come to fruition or is torn from under me. Either way, I rarely give in. I rarely give up. This stubborn streak runs in my blood from both my mom and dad. Perseverance is different from stubbornness, because perseverance is usually a positive thing. To persevere means to endure even when things get crazy difficult and complicated. It means to hang on and not give up. One way I saw her persevere was with her caretaking of my grandfather. When my grandfather became old and ill, she took care of him. Incidentally, he also was unreasonably stubborn–so much so it took FIVE heart attacks to kill him. Even though his doctors warned him to quit, he chewed tobacco and drank until his dying day–well into his 80s. I really thought he was never going to die–I thought even death was a bit scared of him. My grandfather was cranky and hard to please–but still my mother checked on him and bought him groceries and took him to the doctor. I didn’t understand why–he was mean to her, often complaining about the brands she chose or how she paid the bills, and he was often hurtful in word and deed. Yet, she never gave up on him. 3. To not waste anything. My mom is the queen of reusing and recycling before it was cool to do so. She rarely throws anything away, which can sometimes be a bad thing, but you could never accuse her of waste. 4. How to make a meal from nothing. When I look back now, I know my family was poor, but Mom saw to it we always had food in our stomachs. I never felt the sting of poverty in my belly. As an adult, I know now that many times we probably had very little and we rarely had an excess of anything, but we were never hungry. Mom never used food stamps, though we probably qualified. We did make use of the free lunch program at school, though. Mom would make the best pinto beans, fried potatoes and homemade biscuits ever. Understand that this was before anybody cared about carbs, ok? 5. My love of writing. My mom often jotted down short stories on notebook paper, and I would sometimes find them. She wrote about her childhood in rural Arkansas, her parents, her family, working in the fields, and meeting my dad and falling in love. I credit much of my love of writing to her. Anyway, I hate it when people blame their mothers for everything and never give them credit for what good they did. Sure, we will never see eye-to-eye, but that doesn’t really matter. My love for her remains. I will never forget the sacrifice, the hard work, the devotion she demonstrated–these are the things that endure. Florists and restaurants and card suppliers make tons of cash as kids rush to “prove” their devotion to their moms. Woe to the child who doesn’t! Let the grudges begin. Can I propose to you an option? Let’s not say “Happy Mother’s Day” on Facebook, or Twitter, or any other social media. Why? I’ll tell you. Not everyone loves Mother’s Day. What if you are a woman who always wanted to have kids but can’t? Seeing the cards and roses and special recognition in a church service is undeniable painful. What if you are a woman whose child/children have died? You are no less a mother, but the holiday itself serves little as a painful reminder of loss. What if you are a woman who has recently suffered a traumatic miscarriage? What if your miscarriage was years ago? Does that make it less painful, less like broken glass cutting the heart? Not so. In the land of mothers and not-mothers…where do we stand? I’ll tell you: we are mothers. Period. What if your own mother was abusive or neglectful or dismissive or worse–indifferent? It’s been said that indifference is worse than abuse. I can believe that. What if you never wanted children? Is that ok to say in this day and age? I think so. It should be if it’s not. We are a free country. But choosing the option to not have kids in a culture where 19 Kids and Counting is a popular show–the quiver-full mentality–is sometimes viewed as weird. Sometimes, women choose not to have babies because they had such a difficult childhood they don’t feel they want to. Other times, women who love kids just have different goals. Sometimes, women make a conscious choice to not have children for no earth-shattering reason. It’s just because they don’t want to. That’s okay too. Better that women make a choice to not have children rather than carelessly give birth to uncared for children. Sometimes, in our country, we boast that we are pro-life, but we stop caring once that life is here. It’s not my kid. I have my own problems. You can’t feed yours? Too bad for you. None of this resounds in the heart of the Savior, the One who loved children and mothers and non-mothers equally. So before you say “Happy Mother’s Day”, think about it. I’m just putting that out there. Let’s be diligent about Mother’s Day. Yes, celebrate if you wish. Let your little darlings make you hand casts and burnt toast. This is one of the perks. But let’s be ever kind and careful to our sisters who may be hurting. Instead, let’s celebrate womanhood itself. That’s a worthy cause! We are all women, after all.